Both are globally recognized icons, yet their areas of expertise are seemingly worlds apart. 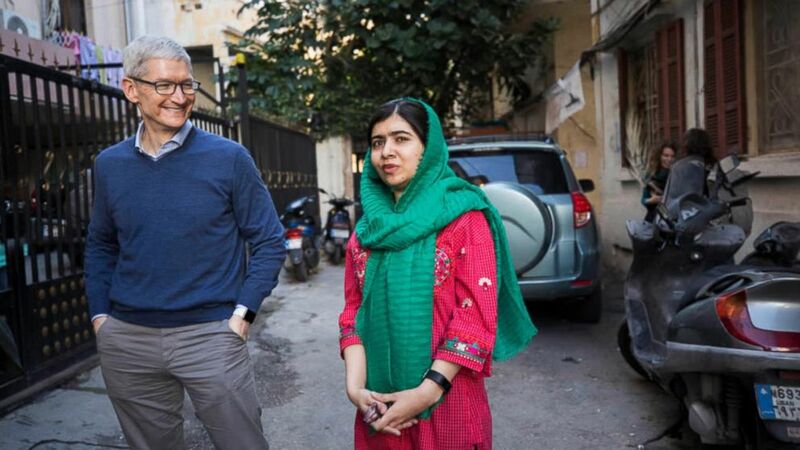 One is Tim Cook, the tireless and philanthropic chief executive officer of Apple Inc.; the other is Malala Yousafzai, the Nobel Peace Prize Laureate activist who fights for -- and puts her life on the line for -- girls' education around the world. The unlikely pair came together on a recent January afternoon in downtown Beirut to announce a shared vision. They were collaborating to make quality education available for girls and young women wherever they live in the world. Together, they say they will significantly expand the work already being done by Malala’s efforts to support girls’ education and advocate for equal opportunity, especially targeting the 130 million girls in the world who have no access to quality education. They don’t yet know exactly how they will accomplish this enormous feat, but they say they’re dedicated to finding the answer. (ABC News) Activist and Nobel Peace Prize Laureate Malala Yousafzai and Apple CEO Tim Cook are collaborating on education for women and girls. The two met to discuss the effort with ABC’s Terry Moran in Beirut, Lebanon, Jan. 20, 2018. 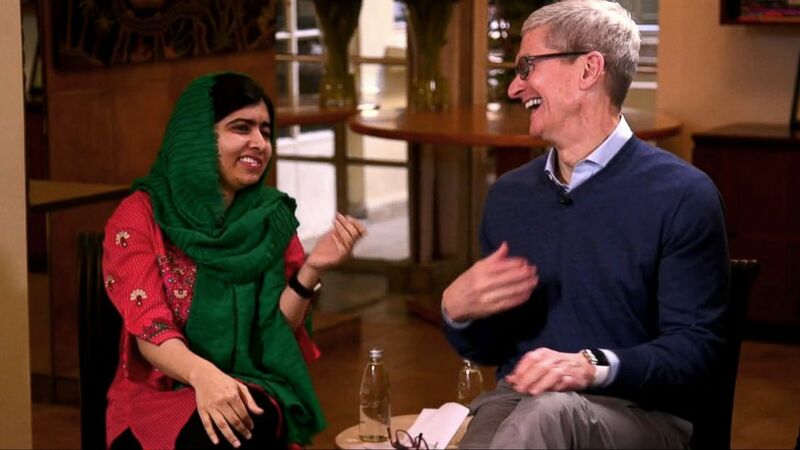 Hear more from Tim Cook and Malala Yousafzai on "Good Morning America" today. Apple and Malala Fund announced Monday that they will partner to champion "every girl's right to 12 years of free, safe, quality education." Through the partnership, Apple is hoping to double the number of grants awarded to Malala's Fund and extend programs to India and Latin America. The goal is to extend secondary education opportunities to more than 100,000 girls. Cook and Malala met just three months ago while Cook was on a business trip to England, where Malala is a student at the prestigious Oxford University. Yet, that initial encounter provided a spark they both hope will now lead to even greater accomplishments. “We started talking and it became so clear that the values we share were so aligned. It was then a matter of what to do together not a matter of whether,” Cook told ABC News. Malala has been advocating for girls' education for years. Before she was even a teenager, Malala began speaking out about life under the Taliban in her native Swat Valley, Pakistan. In retaliation, gunmen tried to murder her with a shot to the head. It was an ordeal that she barely survived but one that taught her to cherish her courage and to stand up for her beliefs. When asked to describe Malala, the youngest ever winner of the Nobel Peace Prize, Cook’s eyes lit up. She has a rare trait of courage with a big C.
“She has a rare trait of courage with a big C," he said. “My heroes in life were people with enormous courage, who were willing to do everything, including risk their lives, for their cause and purpose. She has done this at a very young age and it's just amazing." In parts of the world where the cards are stacked against young girls trying to make a better future for themselves, Malala is viewed with awe. When a small group of Syrian refugee girls came face to face with her that morning in Beirut, more than one of them burst into tears, to be comforted by hugs and soothing words from their hero. 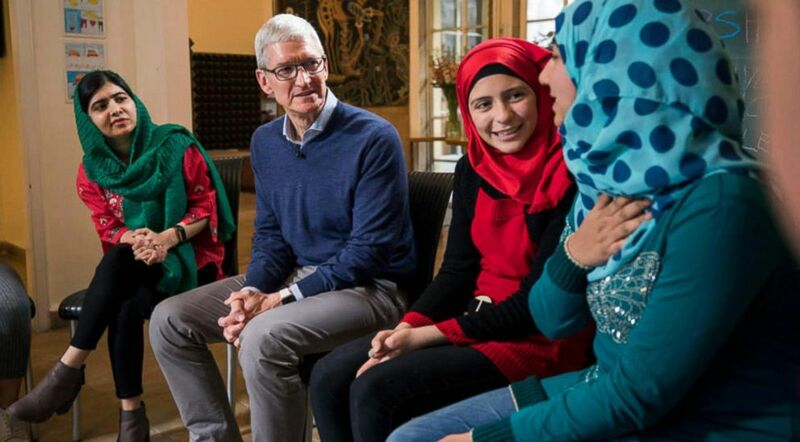 (ABC News) Activist and Nobel Peace Prize Laureate Malala Yousafz and Apple CEO Tim Cook talks with girls from Syria during a meeting with refugees in Beirut, Lebanon, Jan. 20, 2018. Sitting down to a roundtable discussion with the group of girls who had fled the war in Syria, Malala said she was encouraged. Many obstacles stand in the way of the kind of education that can elevate a young girl out of a life of poverty. During their discussion, one of the girls admitted her father demanded she drop out of school. For Malala, it’s a story she has heard many times before. Her solution was to offer whatever help she could to smooth things over with the girls’ family. Another girl talked about how she hopes to become an architect, saying she chose this profession on the same day she fled Syria, hoping to return one day and help rebuild. She then broke down in tears.